50 sq. kms sanctuary near Bassi, supports a population of panthers, wild boars, antelopes, mongoose and migratory birds. Prior permission has to be obtained from the district forest officer, Chittorgarh before visiting the sanctuary. One of the oldest towns in Rajasthan, Nagri is 17 kms north of Chittorgarh. Hindu and Biddhist remains from the Mauryan to the Gupta periods have been found here. A castle said to have been built by Rao Shakti Singh, the youngest brother Maharana Pratap Singh. Now it has been converted into a hotel. Situated on Chittor - Udaipur road. It is modern temple dedicated to Lord Krishna and is an important pilgrimage spot for Hindus. Situated in the lush green region of the bhainsrodgarh. This sanctuary is well known for its valuable archaelogical. A 16th century fort situated near Pratapgarh. It is famous for its palaces and jain temples. According to legend, Bhim, one of the Pandava heroes of the ' Mahabharata ', is credited with the fort's original construction. All of Chittor's attractions are within the fort. The main gate on the eastern side of the fort is known as the Surajpol. From the western end of the fort, there are fine views over the town and across the surrounding country-side, as well as a less-than charming view of an enormous cement factory. It was built in 1440 AD. by Maharaja Kumbha, a powerful ruler of Mewar, to commemorate his victory over the Muslim rulers of Malwa and Gujarat. It is 37 metre high structure with nine storeys, covered with exquisite sculptures of Hindu deities. Built beside a large pool with a pavilion in its centre. Legend relates that, as Padmini sat in this pavilion, Alaud-din was permitted to see her reflection in a mirror in the palace. The bronze gates in this pavilion were carried off by Akbar and can now be seen in the fort at Agra. A temple of mother Goddess Kali Who is the symbol of power. Originally it was built as a Sun temple in the 8th century and later was converted into Kalika Temple in 14th century AD..
Close to the Fateh Prakash Palace is the ' Meera temple ', built during the reign of Rana Kumbha in the ornate Indo-Aryan style and associated with the mystic-poetess Meerabai. The larger temple which is in this same compound is the Kumbha Shyam temple, or temple of Varah. 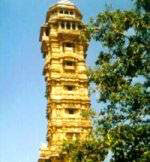 By Bus : Chittorgarh is on the main bus and train routes. By road, it's 182 kms from Ajmer, 158 kms from Bundi and 112 kms from Udaipur. There are frequent connections to these places. By Train : Chittorgarh has train links with Ahmedabad, Ajmer, Udaipur, Jaipur, Kota and Delhi.